Not that it was a huge surprise, but the BYU Cougars are the preseason favorites to win the West Coast Conference as voted on by the coaches. In fact, the Cougars earned a unanimous vote for first since coaches cannot vote for themselves – meaning that Heather Olmstead chose San Diego. 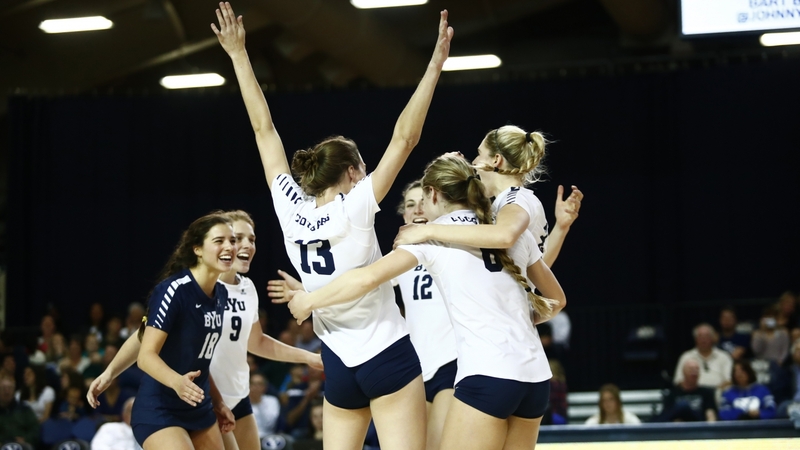 BYU is preseason ranked 8th in the AVCA Coaches Poll and 5th in VolleyMob’s Preseason Top 25. They’ve made six straight Sweet 16s and have won or shared five of the last six league titles, including last season when they went 30-3 (17-1 WCC). Now they return five starters plus the libero, with five of that group earning All-WCC Preseason Volleyball Team – no other school had more than two. In terms of those aforementioned Toreros, they are the clear-cut second choice after sharing the conference title last season. They do lose the 2017 WCC Player of the Year in Kristen Gengenbacher along with all-leaguer Jayden Kennedy, but bring back enough, including a pair of preseason performers, to be ranked 14th in the AVCA Coaches Poll and 21st in the VolleyMob Preseason Top 25. Loyola Marymount has emerged as a steady top half team in the league and are now just a few years removed from their Sweet 16 run in 2015. Last year was a bit of a building year for the Lions in which they still went 17-13 (9-9 WCC). For 2018 they have a pair of outside hitters who are on the preseason All-WCC team. Pepperdine isn’t far behind in points from the Lions either and are the only other school with a preseason performer. Gonzaga rounds out the top five and is closely followed by Santa Clara. Saint Mary’s and Portland come in seventh and eighth respectively. Pacific, who has lost a handful of players to transfer this offseason, is in the bottom next to San Francisco.